The Faith That Time Forgot is now a book! So what is “the faith that time forgot”? Have you ever wondered if there is more to the Christian story than you were taught? Are you a seeker for the truth, a truth that may very well lead beyond the well-worn paths of traditional religion? The Faith That Time Forgot presents new insights and alternative perspectives to many spiritual and theological issues, inviting you to come on a mystical, magical journey of self-discovery and spiritual growth. Go beyond your preconceived limitations and explore the reaches of the unknown. Much has been left in the shadows over the centuries. Much has been entombed, but not for eternity. Now is the time to bring light into this darkness and allow the silent shadows to speak. This is a quest for the Grail within yourself – your own Holy of Holies. I am totally convinced that we are living in an absolutely critical time in human history. Each one of us has an opportunity and a responsibility to step up and make a difference in the best way we possibly can. This book is my contribution to that effort. It is my fervent hope that these words will provide an open door to the Spirit of Love that is your own Holy Grail, your innermost heart and soul. Welcome to this journey of Light and Truth. It is my honor to be your guide. May your journey be blessed by the angels and remember always that God is Love and God is Light. In that Light there is no darkness. In that Love there is no fear. Therefore, trust always in that Love and walk always in that Light, and fear not. The Faith That Time Forgot is available from Amazon in both paperback ($15.99) and Kindle ($9.99) versions. 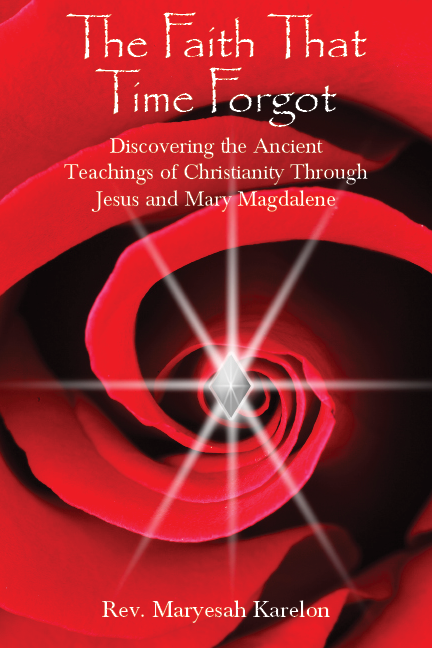 Just click on the following link to go directly to the book on Amazon – https://www.amazon.com/Faith-That-Time-Forgot-Christianity/dp/1732180601/. This link will allow you to order the book as well as preview it by reading the Introduction and part of the 1st chapter for free. For questions or further information, please feel free to drop me an email at maryesah@magdalenerose.org. And if you do purchase the book, I’d greatly appreciate your feedback in a review on Amazon. Your review could help promote the book, so thank you in advance!